A race won by Rapid Redux, the 18th victory in the 5-year-old gelding's record-breaking 20-race winning streak, was investigated for impropriety by the Board of Stewards at the Charles Town racetrack in West Virginia. Owned by Robert Cole Jr., and trained by David Wells, Rapid Redux won the 1 1/8-mile dirt race by 4 3/4 lengths on Oct. 14 as the 2-5 favorite in a field of six. The investigation was the result of rampant rumors circulating at Charles Town the day of the race that two horses that posed a significant threat to Rapid Redux would be scratched that evening. The two runners, Disco Indy and Valid Venture, were to run as an entry for Mountaineer Park-based trainer Scooter Davis, who also has horses at Charles Town. Erich Zimny, the director of racing operations at Charles Town, said he grew concerned enough the day of the race to report the rumors to the stewards. Disco Indy and Valid Venture were scratched when Davis called in and said he was having van trouble, chief steward Danny Wright said. Both runners since have won their subsequent starts. Wright said he sent chief investigator Danny Frye down to the Charles Town barns of Davis to see if either Disco Indy or Valid Venture already were on the grounds. He said tattoos were checked on the horses there. 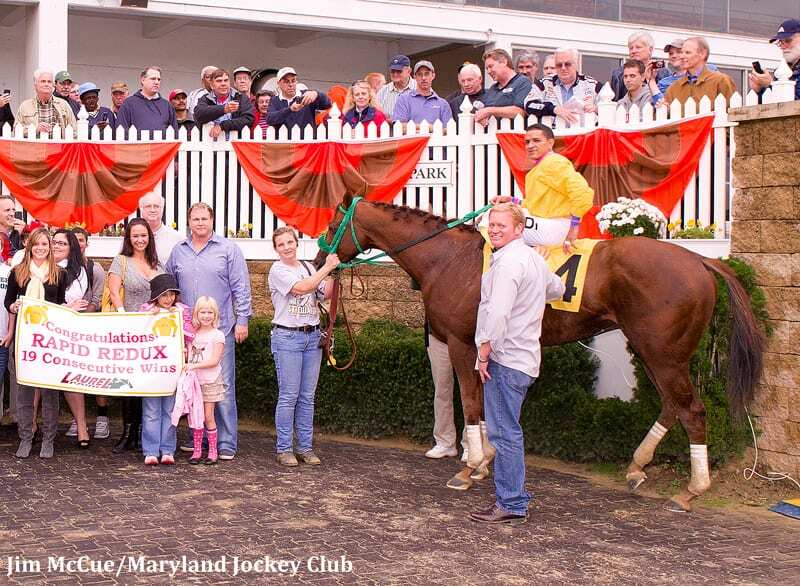 Cole, who led the country in victories by an owner in 2008 with 238, claimed a horse named Sugarplumfairy from a race Oct. 12 at Charles Town and gave it to Davis to train, three days after entries were drawn for the Rapid Redux race. Previously, the owner and trainer never had worked together. Sugarplumfairy won her first start for her new connections on Nov. 9. Cole said he has since given another horse to Davis and had another claim for him voided. Cole said he never was contacted by the stewards during their investigation of the Oct. 14 race. Asked what Wells, the trainer of Rapid Redux, had told him about his contact with officials, Cole said, “Nothing of great importance. “I've not been called about anything on this issue,” Cole said. “One or two fans might have said something. I definitely haven't heard from the stewards. Scooter has not called me about it, and I have not been called by any stewards. Wright said it should not be considered out of the ordinary for Cole to have given horses to Davis. “Robert Cole changes trainers like you and I change socks,” Wright said. Cole, 45, of Highland, Md., got into racing after finding success with Service 1st Mortgage, a small firm he founded in 1999. Cole is the grandnephew of William P. Cole, who served two terms in the U.S. Congress. Davis could not be reached for comment. Scratches have been common features during Rapid Redux's winning streak: There have been 40 runners scratched across the 20 races – more than 30 percent of the entrants – and the fields have averaged less than 5.5 horses. Charles Town-based trainer David Walters said it was common knowledge at the track the day of the race that Valid Venture and Disco Indy would be scratched. Walters said it was wrong for the race to have been allowed to take place. Zimny declined to comment on the results of the stewards' investigation. “Mr. Cole and Mr. Wells are free to race their horses here,” he said. Editor's note: Tuesday at Laurel Park, Rapid Redux will attempt to tie the modern-day U.S. record of 19 victories in a calendar year – set by Citation in 1948. At least one researcher has uncovered evidence that prior to 1920, more than one horse may have eclipsed that number, including Donald MacDonald in 1913. This entry was posted in Ray's Paddock and tagged Charles Town, David Wells, Erich Zimny, Horse Racing, horse racing records, Rapid Redux, Robert Cole Jr., thoroughbred, West Virginia horse racing by John Scheinman. Bookmark the permalink.